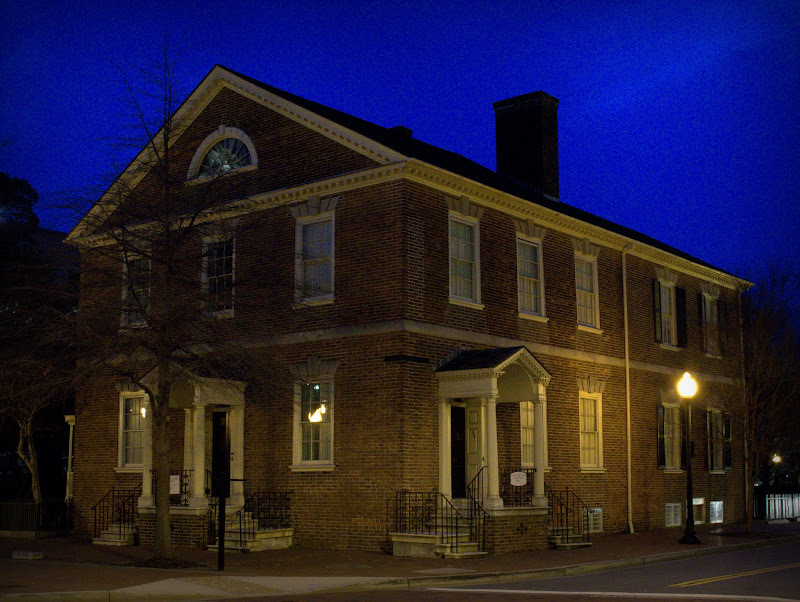 The last in my month long daily series of Norfolk @ Night photos is the Moses Myers house at the corner of Freemason and Bank Streets. Built by Moses Myers a merchant of Dutch-Jewish ancestry who moved to Norfolk from New York, the house was occupied continuously by members of his family until 1931 when it was opened as a museum. Today it is operated by The Chrysler Museum and contains a large quantity of period furniture of American and English design, portraits of Moses Myers and of his wife, Eliza Judd by Gilbert Stuart, and a Thomas Sully portrait of their eldest son John. Canon G15, 1/13 sec @ f/4.0, ISO 800. The old Norfolk Academy Building was completed in 1840 and designed by architect Thomas U. Walter, famous for his design of the U. S. Capitol dome and two other nearby surviving Norfolk landmark buildings. It is listed on the National Register of Historic Places. 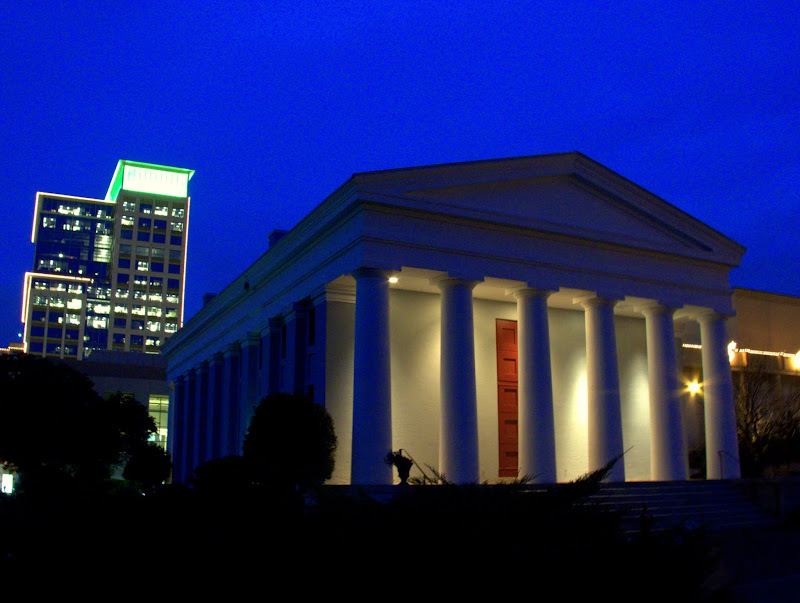 The brick building is in the Greek Revival style modeled on the plan of the Temple of Theseus. The facade has a double portico supported by six Doric columns. Today the building is home to the Hurrah Players and it previous housed the Norfolk Juvenile and Domestic Relations Court and the Norfolk Chamber of Commerce. Rising behind it is Norfolk's newest skyscraper, the Wells Fargo Center completed in 2010. Canon G15, 1/3 second @ f/4.0, ISO 800, handheld with shutter released by the two second timer. 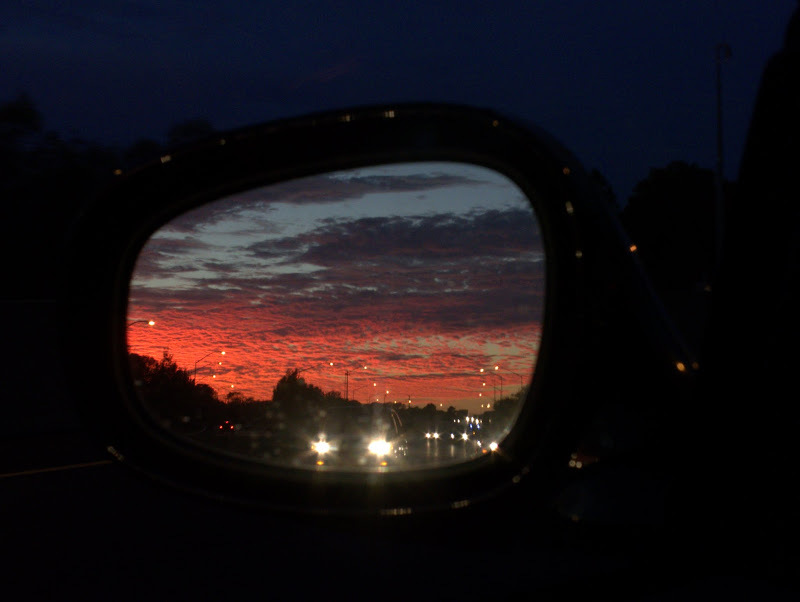 Heading into Norfolk early one morning chased by a spectacular sunrise. Canon G15, 1/40 sec @ f/5.6, ISO 400. Looking at the northern part of Norfolk Virginia's downtown during a lovely twilight evening. The Wells Fargo Tower catches the last of golden sunlight in its windows below the green and red holiday lighting of its penthouse. You can also see the Freemason Street Baptist Church's steeple - once the City's highest structure, Norfolk Scope, Chrysler Hall and MacArthur Center. Canon G15, 1/40 sec @ f/3.2, ISO 800. 6 - Edward Bacon is the father of actor Kevin Bacon. So there you have it. Canon G15, 1/15 sec @ f/3.2, ISO 800. The brick entrance sign of my alma mater Old Dominion University at the southwest corner of West 49th Street and Hampton Boulevard in Norfolk, Virginia. 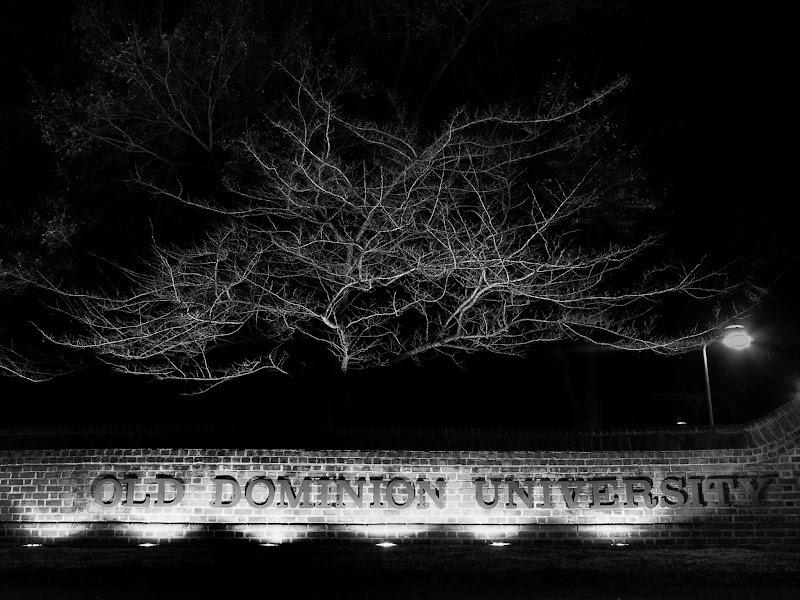 ODU began in 1930 as the Norfolk Division of William and Mary, becoming an independent college in 1962 and attaining university status in 1969. Old Dominion University derives its name from one of Virginia's state nicknames, "The Old Dominion", given to the state by King Charles II of England for remaining loyal to the crown during the English Civil War. Canon G15, 1/20 sec @ f/2.8, ISO 800, handheld and converted to black and white using Silver Efex Pro. Norfolk International Terminals (NIT) is the largest of the four facilities operated by the Virginia Port Authority. The terminal has fifty-foot-deep entrance channels at the north and south ends making it "New Panamax" ready. 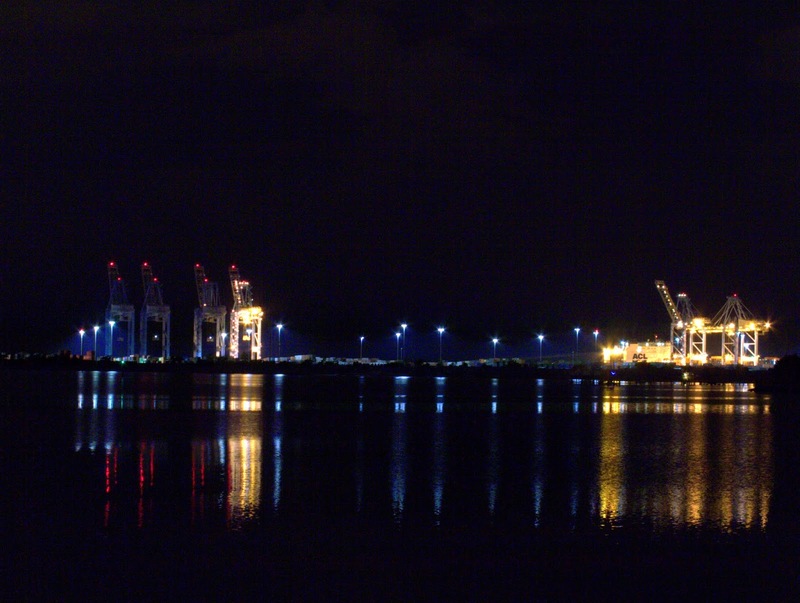 Here you can see some of the eleven Suez-class container cranes working away on a Sunday night. Canon G15, 1 second @ f/4.0, ISO 100 mounted on a tripod. The Wells Theatre in Norfolk Virginia, opened on August 27, 1913. The poured-in-place, steel-reinforced concrete structure was technologically advanced for the period. 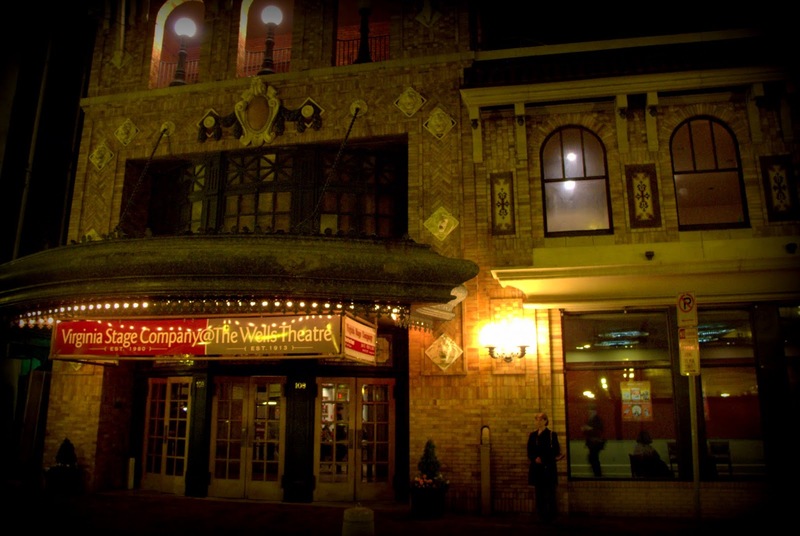 The Wells's ornate decoration made the theatre the flagship of Wells Amusement Enterprises, and continues today as a well preserved example of Beaux-Arts Classicism, a National Historic Landmark and home to the Virginia Stage Company. Canon G11, 1/10 sec @ f/2.8, ISO 400. 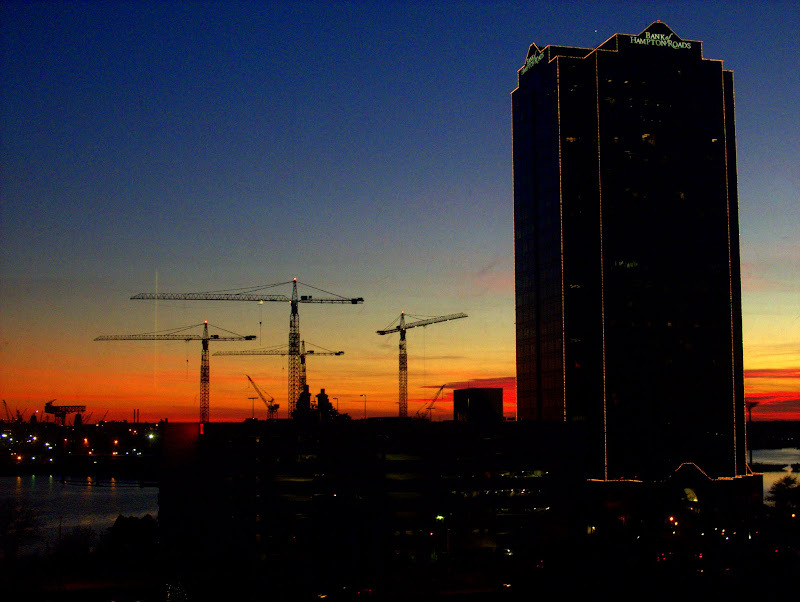 The last remaining light silhouettes the tower cranes of the General Dynamics NASSCO-Norfolk, formerly Metro Machine Corporation, shipyard in the Berkley section of Norfolk, Virginia. 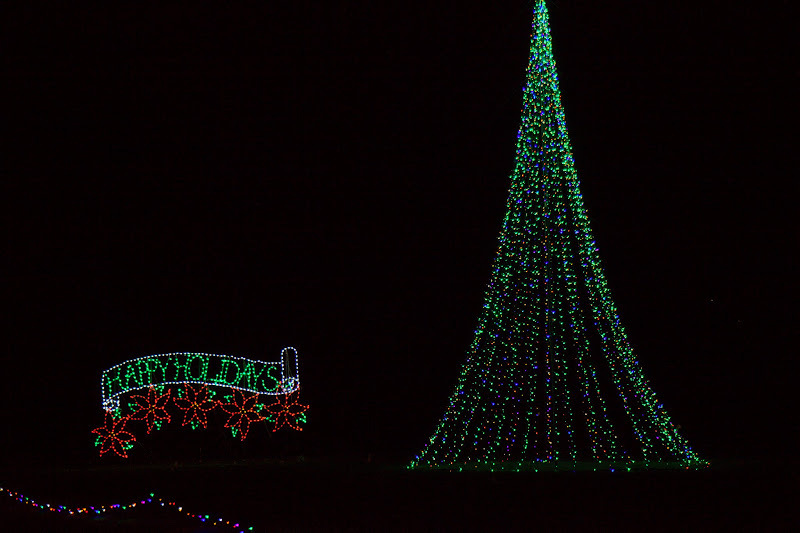 Berkley Virginia was incorporated as a town in 1890 and annexed by the City of Norfolk on January 1, 1906. Thanks to Pamela Marino for letting me use her 5th floor Norfolk City Hall office window to get this picture. Canon G15, 1/40 sec @ f/3.2, ISO 800. This is how I start my Monday, Wednesday and Friday early in the dark morning. I've been at it for three years years now and it has changed my life. Thanks to everyone at Fitness Together Norfolk. Canon G15, 1/20 sec @ f/2.2, ISO 800. 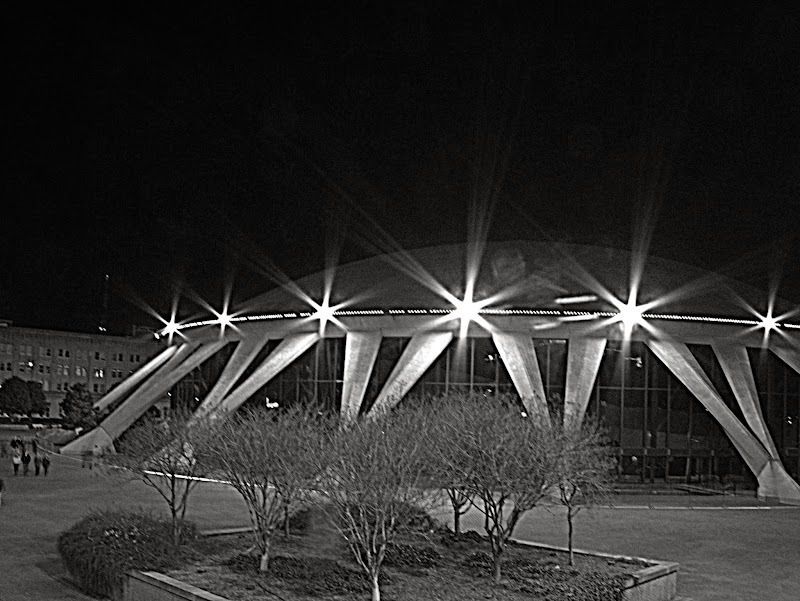 The Scope Arena in Norfolk Virginia is the world's largest concrete dome, which was designed by Italian architect/engineer Pier Luigi Nervi in conjunction with the Norfolk firm of Williams and Tazewell. The venue holds a bit of a political past. According to Wikipedia - After watching the 1960 Rome Olympics on television, Brad Tazewell and Jim Williams, the Norfolk architects who were eventually to partner with Nervi, solicited U.S. Sen. A. Willis Robertson, father of Christian Broadcasting Network founder and former candidate for President Pat Robertson, to build a sports complex in Norfolk. Subsequently, President Lyndon B. Johnson asked Robertson to support federal funding for a multimillion-dollar cultural center in Colorado and Robertson said he would if Johnson would support one in Norfolk. Scope was completed in 1971 at a cost of $35 million dollars with the federal government providing $23 million, almost 66% of the total cost. Canon G15, 0.8 sec @ f/8.0, ISO 200, converted to black and white using Google Picasa. 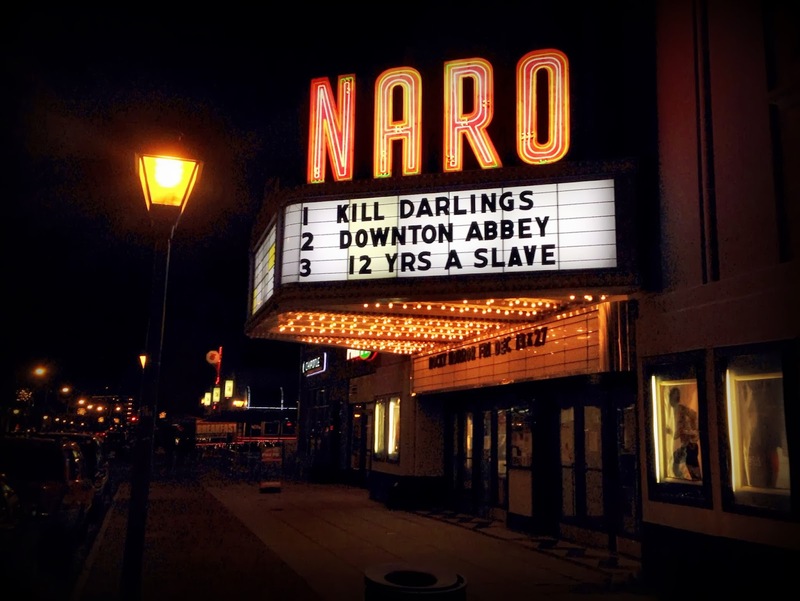 The Naro Cinema is in the heart, same say it is the heart, of the Ghent Business District along Colley Ave in Norfolk Virginia. Opened as The Colley Theater on Feb 24, 1936, it was a modern suburban theater with the latest amenities, 500 seats including a balcony and an art deco design. Since 1977 it has been operated by Tench Phillips and Thom Vourlas as an independent theater featuring foreign, art and independent films. Recently converted to digital projection, the theater hosted tonight's sneak preview of episode 1 of Downton Abbey season 4 for local PBS station WHRO. Chelsea is a small Norfolk Neighborhood near Lambert's Point. 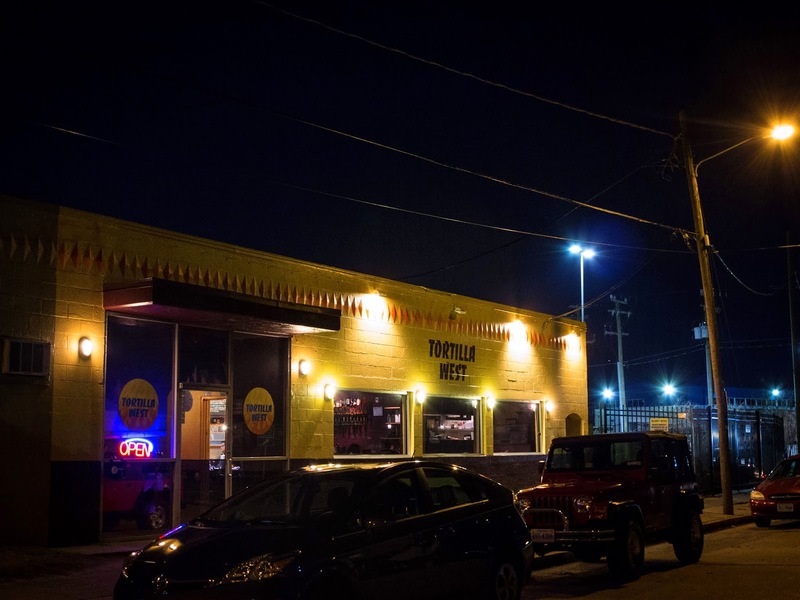 It is home to the Smartmouth Brewery, The Birch, Norfolk's Little Theater and our regular Sunday night dining spot Tortilla West. 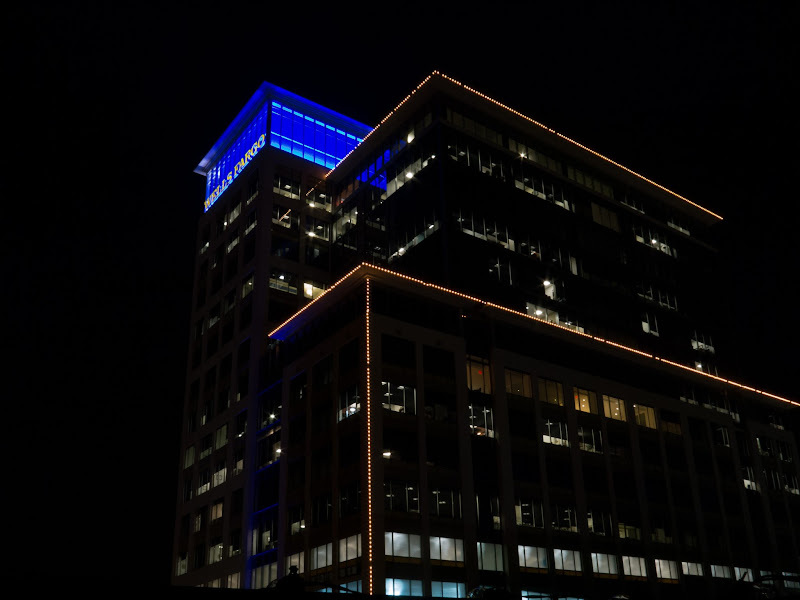 T-West is featured in tonight's Norfolk @ Night photo taken after splitting crab and shrimp nachos, an Allagash Confluence Ale and a Smartmouth Holiday Helper Imperial Red Ale. 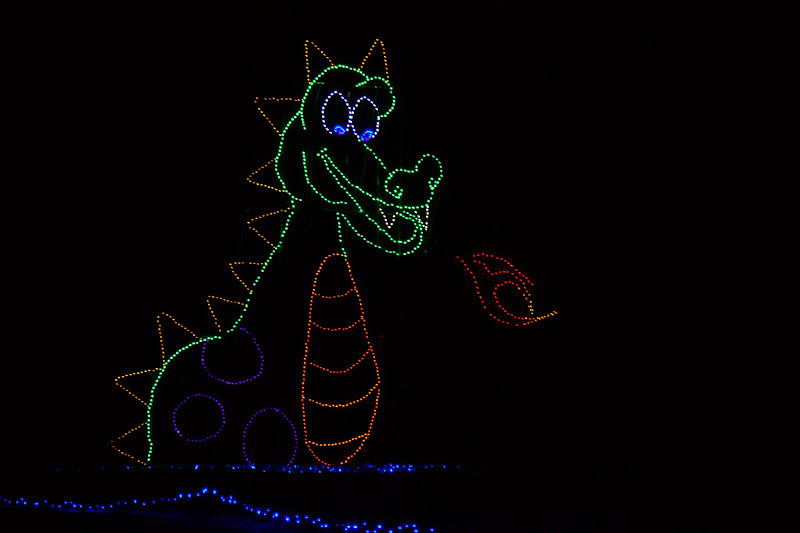 Canon G1X, 1/8 sec @ f/4.5, ISO 1600, focal length 50mm (35mm equivalent). 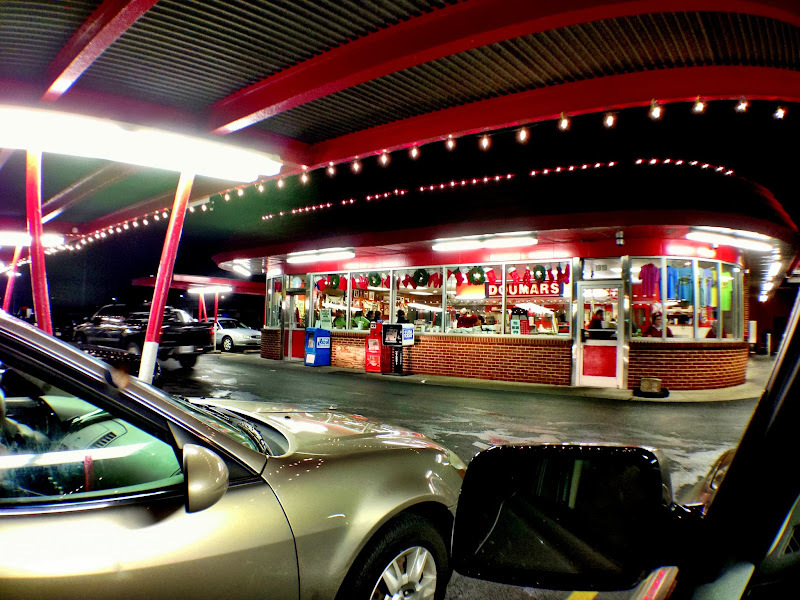 Doumar's @ Night. Over the past 100 years, Doumar’s has become an historic Norfolk landmark and is known for inventing the world’s first waffle cone. Stop by Monticello Ave between 19th and 20th Streets and enjoy a piece of Norfolk’s history and some of the best ice cream cones and barbecue around! Apple iPhone 5, f/2.4, ISO 100, Camera+ App, Olloclip wide angle lens. 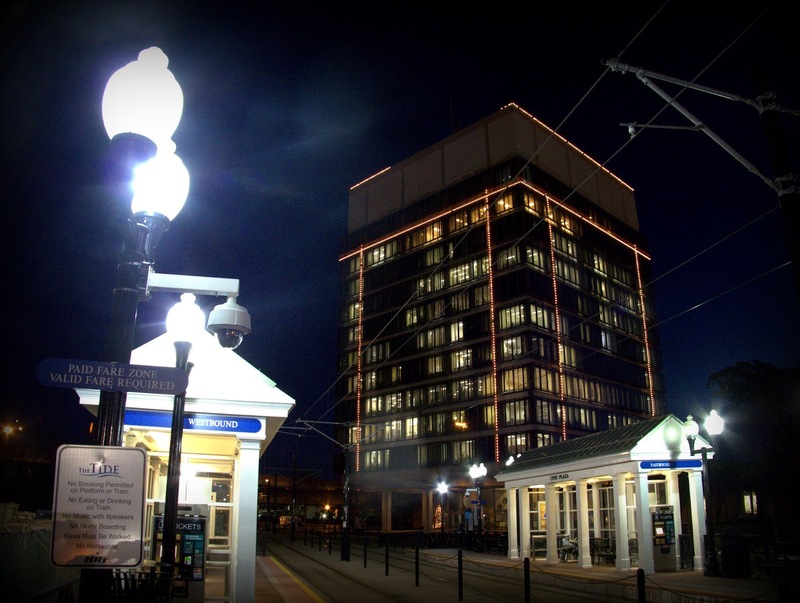 At 340 feet the Dominion Tower is the tallest building in Norfolk Virginia. 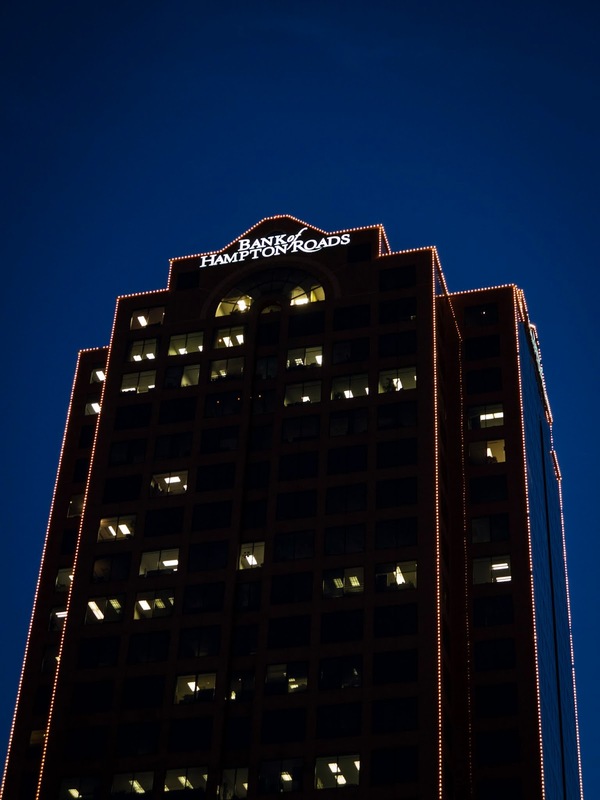 Completed in 1987 this postmodern brown granite skyscraper was named in honor of the state's nickname - "The Old Dominion". Canon G1X, 1/6 second @ f/5, ISO 1600. The 2,500 seat Chrysler Hall was designed by the Norfolk architectual firm of Williams and Tazewell and opened in 1972. 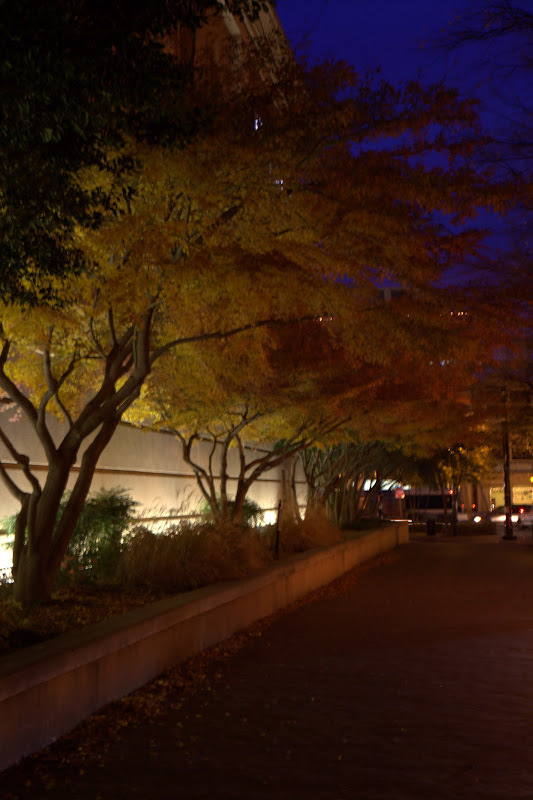 It was named for Walter P. Chrysler, Jr. in recognition of him bringing his world renowned art collection to Norfolk's Chrysler Museum of Art. 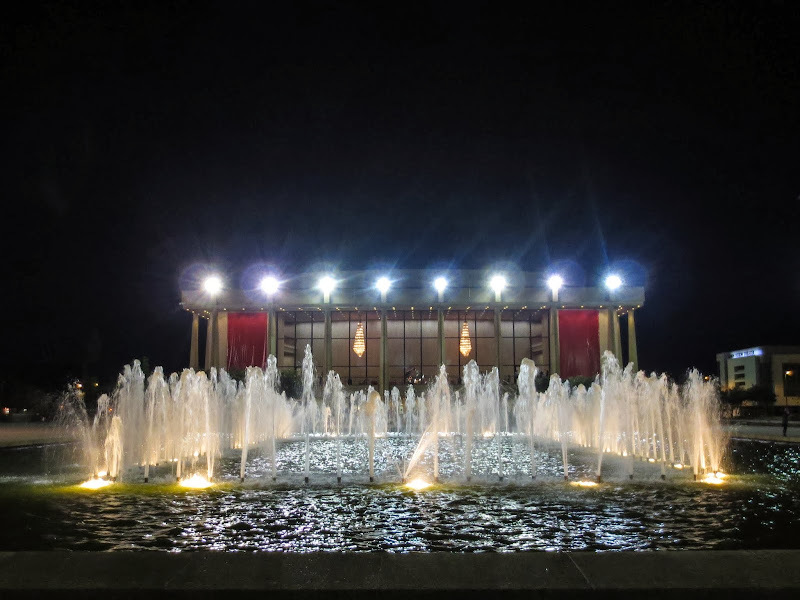 In this photo, the theater is still displaying the large red banners put in place for the Virginia Stage Company's production of the play "Red" about the artist Mark Rothko and the coinciding display of his art at the Chrysler Museum in the fall of 2011. Canon ELPH 110. Up lit trees with fall colors still inplace along Monticello Avenue in Norfolk Virginia. 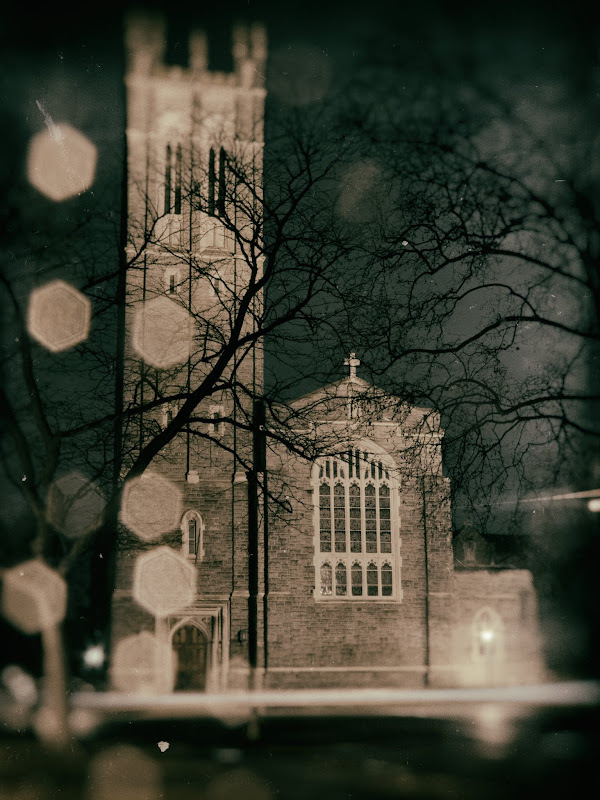 Canon 5D Mark II, 3.2 seconds at f/11, ISO 100. 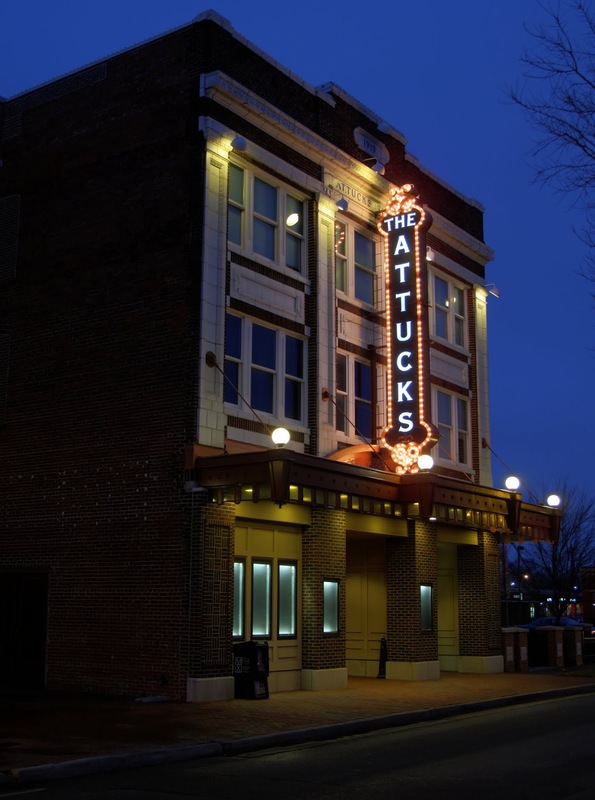 Norfolk @ Night continues with more of a twilight photo of the historic Attucks Theatre on Church Street in Norfolk Virginia. Opening in 1919 it is now a state and national landmark and is distinguished as the oldest remaining legitimate theatre in the nation that was completely financed, designed, constructed and operated by African-Americans. Canon G10, 1 second @ f/3.2, ISO 100. More of my Norfolk @ Night month. 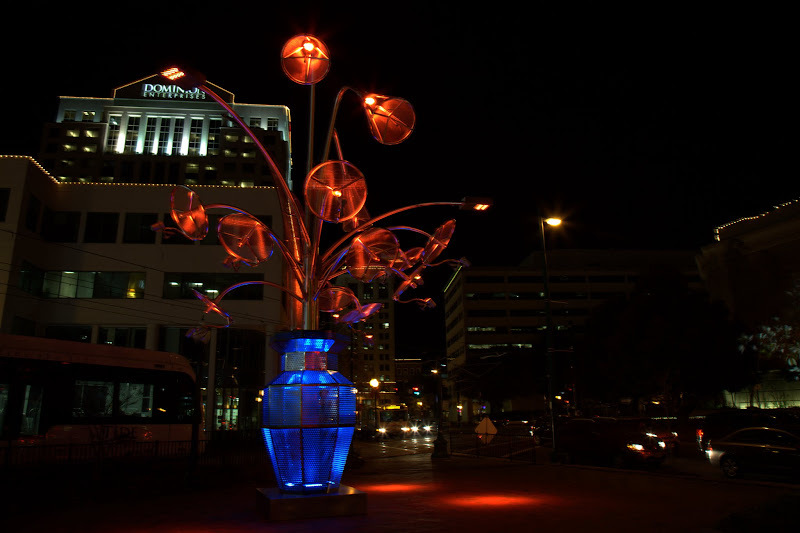 "Metalmatisse is an interactive, stainless-steel, light and sound sculpture designed to compliment the formal European landscape of MacArthur Square. Each flower gives an individual response when prompted by visitors below. 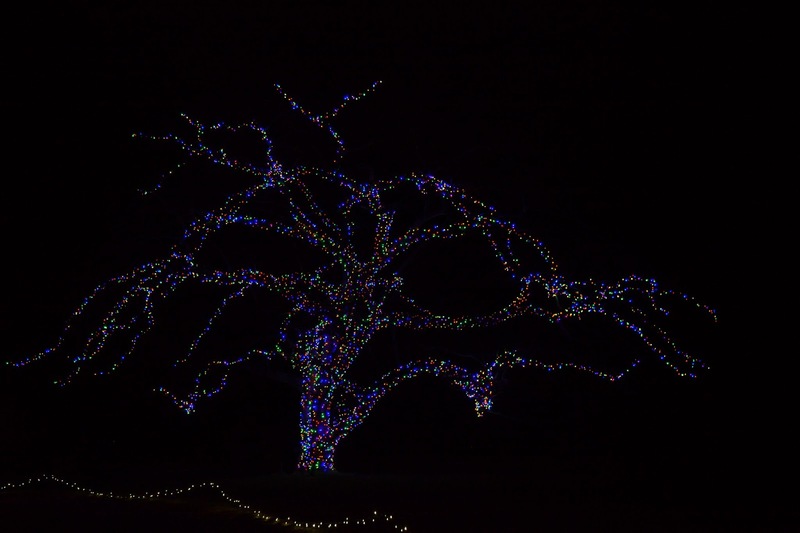 Periodically the entire sculpture comes to life in an orchestrated chorus of light and sound. Vase and bouquet are loosely adapted from paintings of flowers by French artist Henri Matisse with a distinctly modern statement of scale and exuberance." description from NorfolkPublicArt.org. Canon 5d Mark II, 2.5 seconds @ f/11.0, ISO 100 mounted on a tripod. 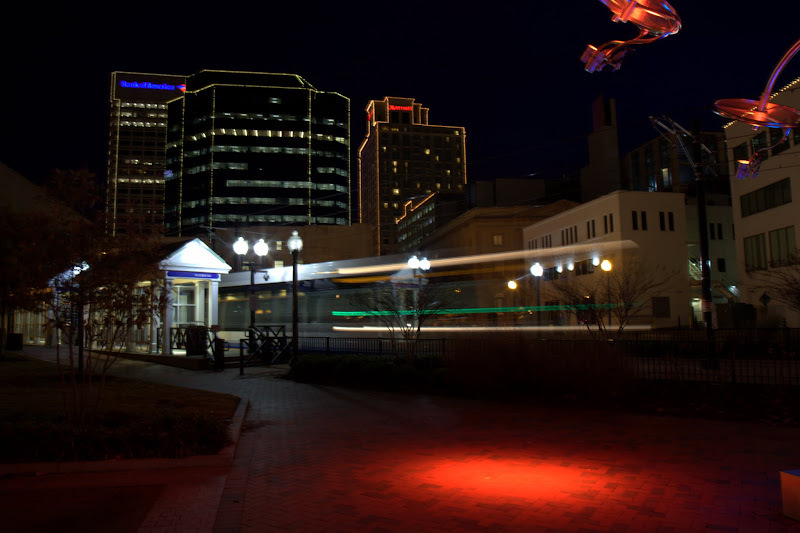 The Tide light rail leaves the MacArthur Plaza Station with the downtown Norfolk skyline as a back drop. Canon 5D Mark II, 4 second exposure @ f/11.0, ISO 100, 24mm focal length. 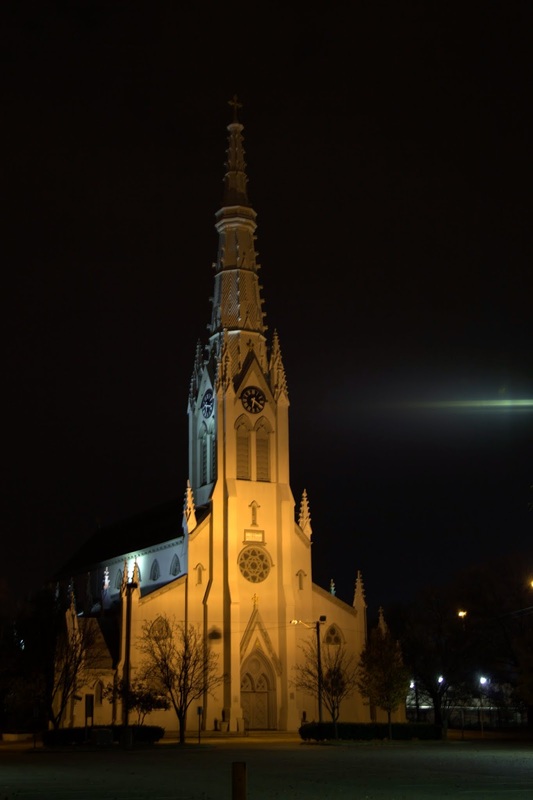 The Basilica of St. Mary of the Immaculate Conception is located in downtown Norfolk. Built in 1858, its clock marks the time of my early morning photo. Canon 5D Mark II, 1 second exposure @ f/4, ISO 100, 45mm focal length. 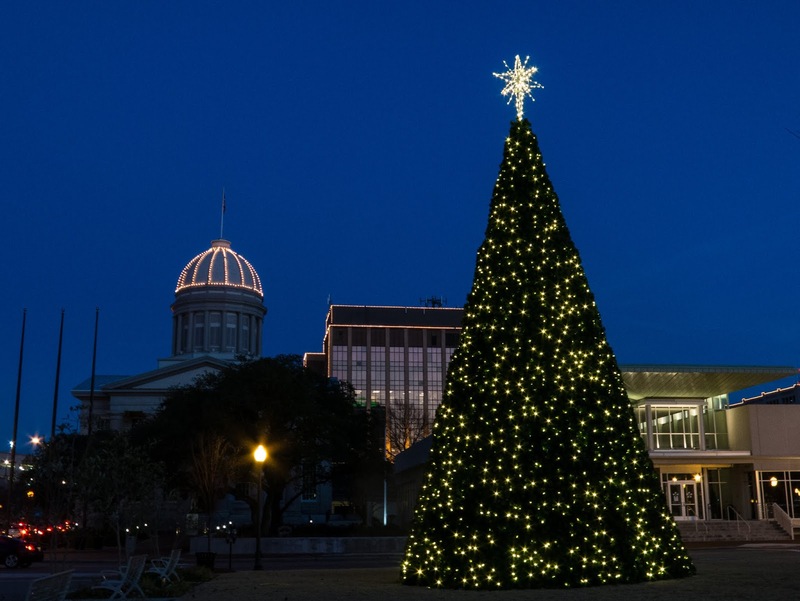 Continuing with my Norfolk at Night theme the dome of the General Douglas MacArthur Memorial is decorated with holiday lights and framed by the City's modern skyline. 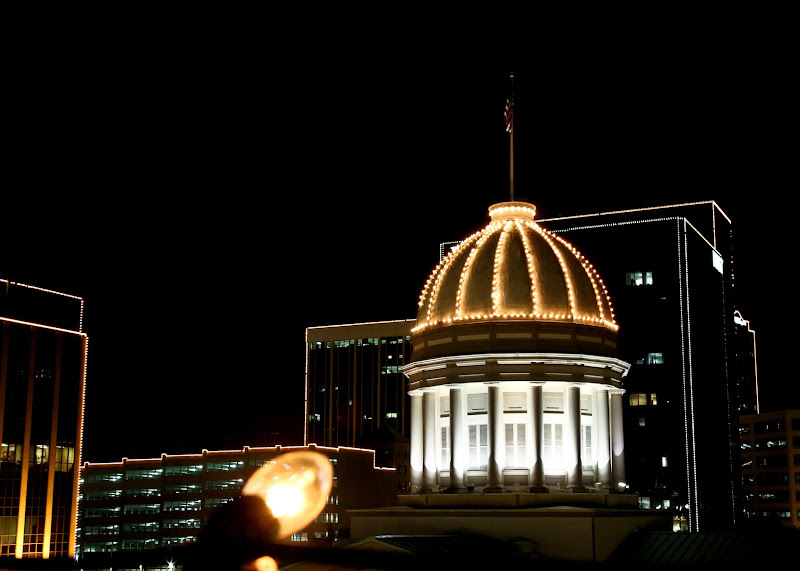 Built in 1850 this Classical Revival structure is the work of Norfolk architect William Singleton consulting with Thomas U. Walter, famed architect of the central dome of the U.S. Capitol building. 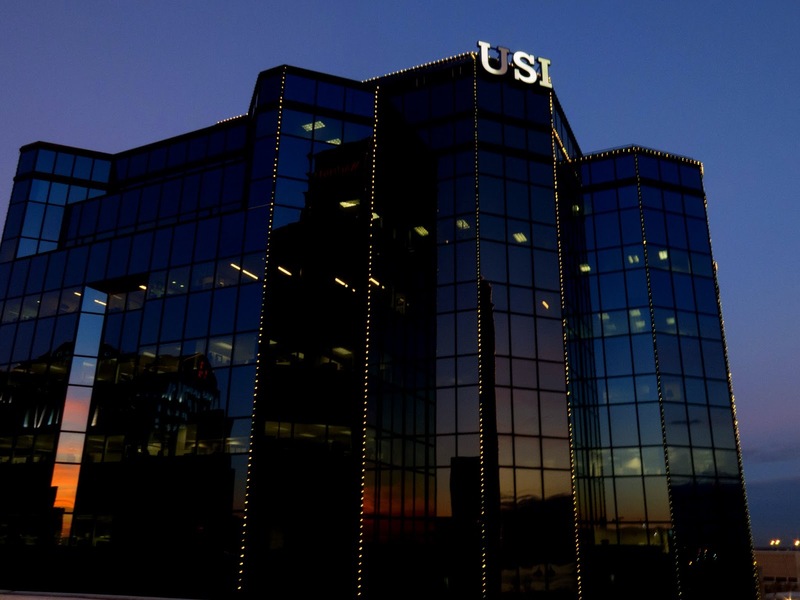 Canon 7D, 1/3 sec @ f/8.0, ISO 200. 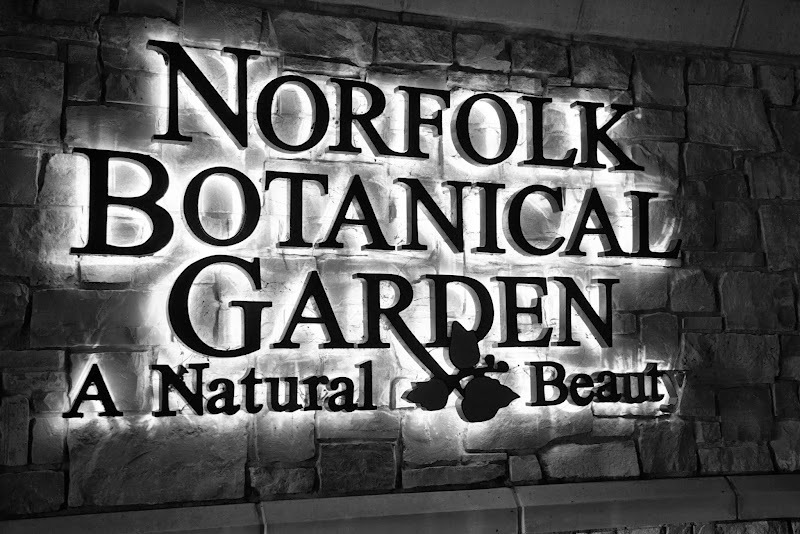 I continue my "Norfolk at Night" month with a picture I took this morning before sunrise and in the rain. 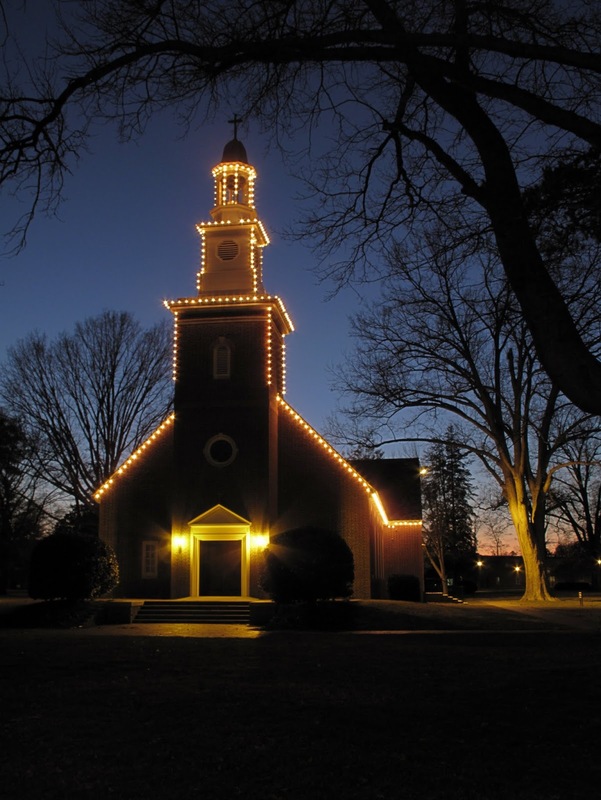 At the intersection of West Olney Road and Stockley Gardens in Norfolk Virginia, sits Christ and St. Luke's Church. The long narrow building of rough-faced random ashlar in the English Perpendicular Gothic Revival style was completed in 1910. It is a spectacular building with a congregation that traces its roots in Norfolk back to 1637. It wasn't raining as I drove to the Ghent neighborhood to take the picture. Just about the time I got the tripod setup, down came the rain. I kept wiping the lens off and trying to shield it from the rain but when I got home tonight and downloaded the images, I found the one with the water spots to be the most interesting. I developed the photo in Lightroom 5 using the Analog Efex Pro plug-in from Google and chose a wet plate camera type to give it an old photo look. A few tweaks with the sliders and you get the image I wanted to share with you. I hope you like it. Canon G15, 4 second exposure @ f/8.0, ISO 80. 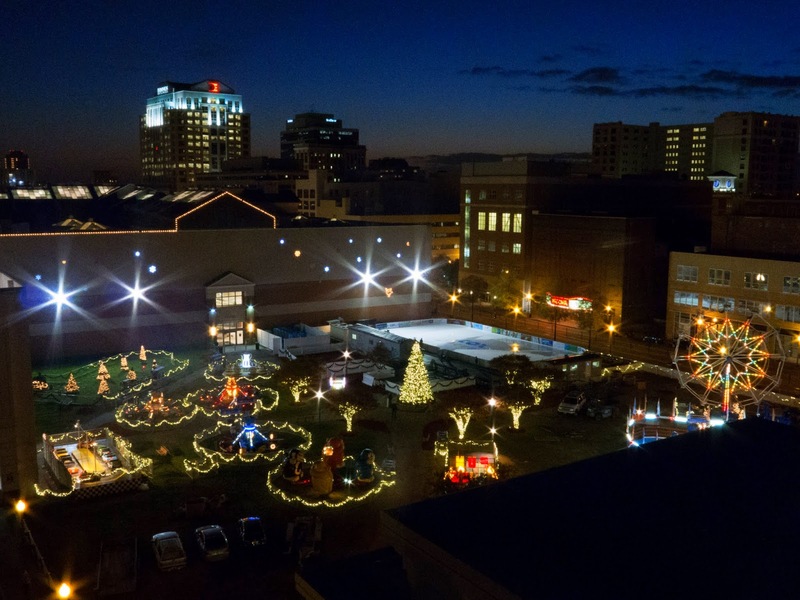 The Winter Carnival at Norfolk Virginia's MacArthur Center shopping mall. Canon G15, 1/8 sec @ f/8, ISO 1600. 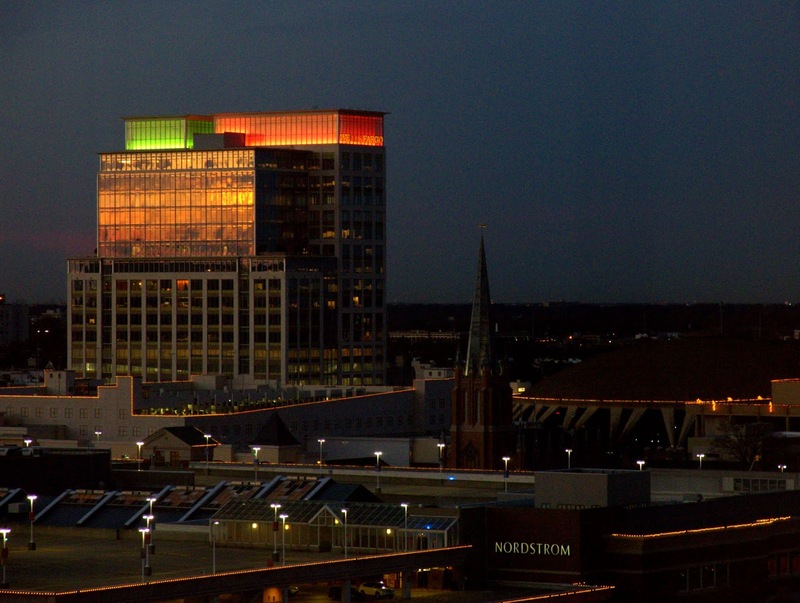 The top of the Wells Fargo Center in Norfolk Virginia with it's holiday lights on. The Wells Fargo Center is a 22 story office, commercial and residential complex completed in 2010. Canon G15, 1 sec @ f/8.0, ISO 100. 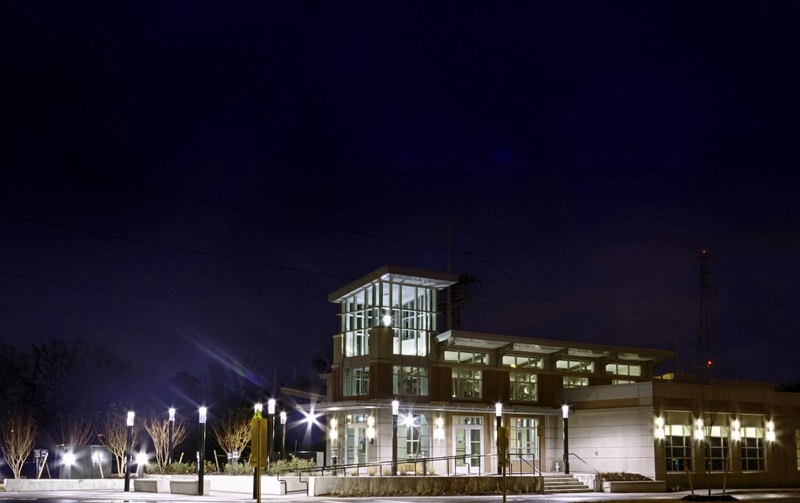 The new Norfolk Virginia Amtrak Train Station scheduled to open tomorrow gleams at night. Last December passenger passenger rail service to Norfolk resumed with daily trips to Washington D.C., New York and Boston. 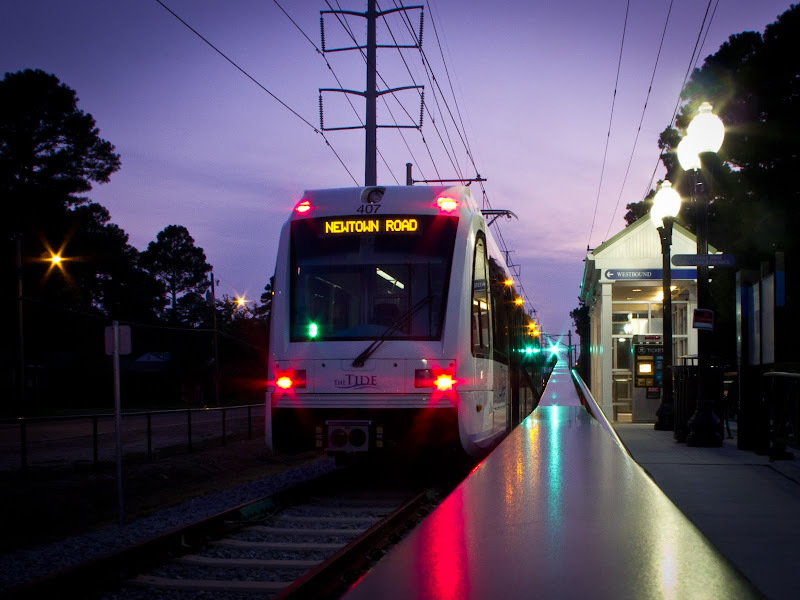 Ridership has been strong and now we have the most modern train station in Virginia. Canon G15, 1 to 1.5 sec, F/5.6, ISO 100 mounted on a trip tripod, HDR compilation of three images spanning 2 f stops.